Over the last few weeks, we’ve been working hard on PublishPress compatibility with Gutenberg. Gutenberg has been a challenge, to say the least. But we’ll have more details on that in another blog post next week. In the meantime, PublishPress 1.17 is available today. It adds some features, fixes a security hole and resolves some bugs. If you have a PublishPress license key and have activated it on your site, you’ll see a new feature. You can now disable the PublishPress branding. Go to PublishPress > Settings > General, and you’ll see this setting, “Display PublishPress branding”. If you uncheck this box, the footer at the bottom of PublishPress pages will disappear. Select notification channel in the profile page: this controls where notifications are sent for individual users. Access the Dashboard, the admin bar, and the “Your Profile” page”: this allows you to block access to several key areas in the WordPress admin. In the WordPress core, this permission is called “read“. Change the role of other users: this controls whether users can promote or demote other users’ accounts. This will help us fix problems more quickly for you. Go to PublishPress > Settings > General > Features. There is now a “Debug” box that you can check. 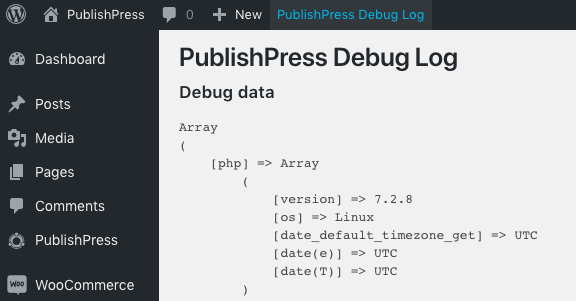 Once the debug feature is enabled, you’ll see a “PublishPress Debug Log” link at the top of the admin bar. We also fixed a security hole with the way that PublishPress handled roles. Thanks to Anthony from qurium.org for reporting the issue. Permalinks now work correctly on multisite networks. We fixed the position for the editorial comments metabox for Gutenberg. We stopped the dashboard widget from showing Published and Private Posts counts.